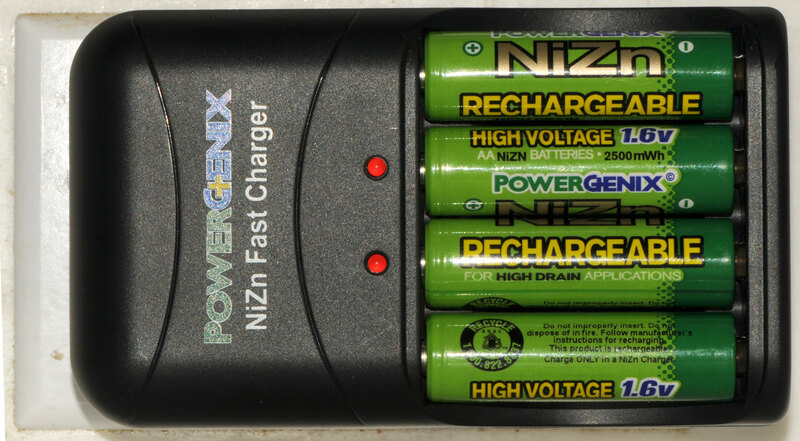 This is a new commercially abailable battery chemistry (Wiki). A friend got this Powergenix kit of 4 batteries and the charger from me from our local Dollar Store. These AA cells have a nominal voltage of 1.6 V which is a little more than the 1.5 V of the common Alkaline cell and a lot more than the 1.2 V for a Ni-Cad or Ni-MH cell, like the eneloop Ready-to-Use rechargeable batteries. They are marked "2500 mWh". Using the nominal 1.6 V rating that means 1562 mAh. For comparison a Ni-MH cell marked 2700 mHh would contain 3240 mWh. So these cells offer more voltage but maybe no as much capacity as some commonly available Ni-MH cells. 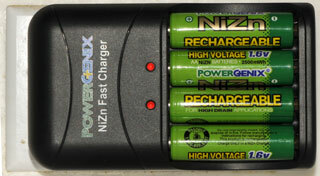 When used the Nikon SB-25 Speedlight the time to full charge is noticably faster. These flashes use a switching mode power supply to step up the input voltage to around 330 V. If the starting voltage is higher and the current capacity is about the same then more power is being applied to charge the flash capacitor. Edison patented this chemistry 684204 on Oct 8, 1901. Using the Maha MH-C9000 Battery Analyzer to discharge the cells (it can not charge them). page created Jan 24, 2011.